The 2014 Corvette Stingray C7 will soon be seen a lot more on US streets, and although it is a vast improvement over its predecessor, there are still rival cars ready to stamp their authority. 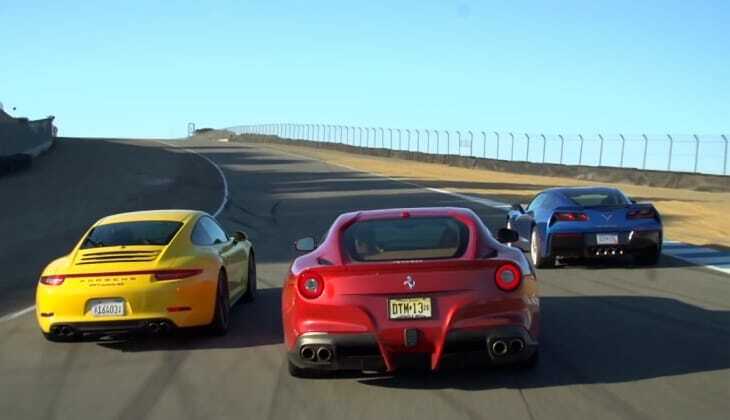 Two of these vehicles are the Ferrari F12 and Porsche 911, and to see which of the three is the best drivers car they were pitted against each other on the Mazda Raceway Laguna Seca. GM’s C7 has a lot of ground to make up because in previous years the Stingray was more for the older gentleman, but this year will be very different, and it needs to be because the Porsche 911 is considered the best drivers car in this market segment, and even though GM has priced their new sports car competitively, they still need to make sure it can punch far above its weight. In the video below we get to see just how the Corvette Stingray C7, Ferrari F12 and Porsche 911 get on, and try not to make any assumptions because you might get it wrong, just as we did. To give you an idea of how they stack up, the 2014 Chevy Corvette Stingray C51 6.2-liter V8 pushes out 460 horsepower, the Ferrari F12 Berlinetta 6.3-liter engine produces 731 horsepower and the Porsche 911 with its rather modest 3.8-liter flat-6 pumps out 560 horsepower, which is rather impressive from such a small engine. However, don’t let that fool you because the 911 has won this challenge two years in a row, and so you need to watch the video to see how it gets on against the other two. We do find it strange how the vehicle that has the least amount of performance comes out the winner, which is why we can’t pay too much attention to the results. How cool would it be to see the 2014 Corvette Stingray C7 pitted against cars in the same price range, such as the Audi TT, M3, C63 and the GT500?